Some updates from the comments sections! 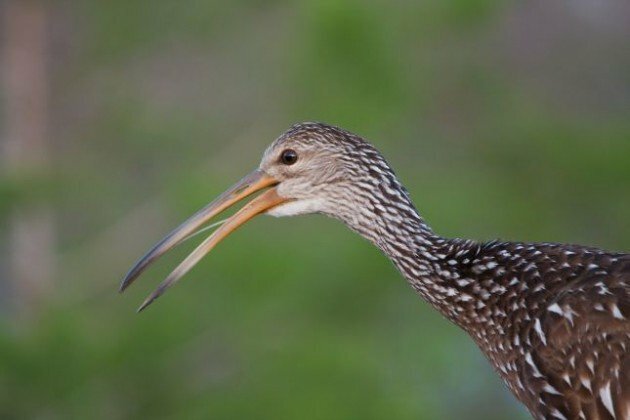 On the Limpkin, the ever-sagicious Rick Wright points out that the ‘gait’ explanation may well be a folk etymology: “I’ve been wondering about this word for a long, long time. The standard etymology limp + -kin doesn’t make much sense to me: by the time this word is attested, -kin wasn’t a productive suffix in English any more, and the bird limps no more than any other long-legged wader.” Further investigation is required! This highlights the problem with naming birds after their calls – the Flickers do not sound like plicka plicka plicka to me, but they may well to others. Sibley gives the contact call was wik-a-wik-a-wik-a, which seems close enough for government work. The Hairy and Downy Woodpecker information is exactly correct, of course, but I stand by my joke that they are still feathers and not hairs. But by far the best we-all-learned-something-here-today comment is “You’re mistaken about the meaning of pileated. The Latin adjective pileatus means “wearing a pileus.” The pileus was an ancient felt cap, often conical in form and coming to a more or less sharp point. The Pileated Woodpecker wears a conspicuous red pileus, hence the name. Other birds with conspicuous caps share the same specific name: e.g., the Capped Heron (Pilherodius pileatus), the Black-capped Piprites (Piprites pileata), the Sooty-capped Bush-Tanager (Chlorospingus pileatus), and so on.” by Zeppo. The pileus was regarded by Romans as a symbol of freedom and is sometimes conflated with the liberty cap seen in artistic iconography. Which would make the Pileated Woodpecker the Liberty Woodpecker, something I think we can all get behind.